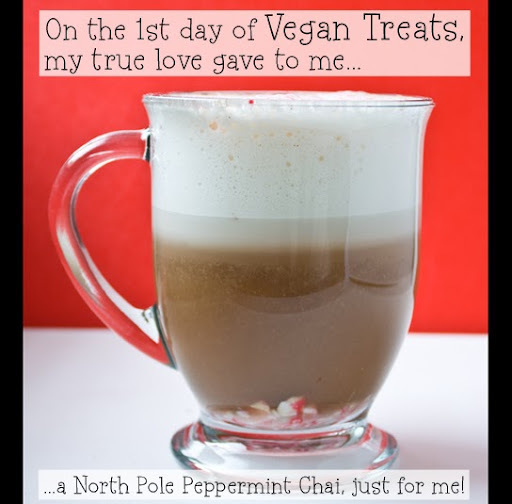 North Pole Peppermint Chai: 1st Day of Vegan Treats. 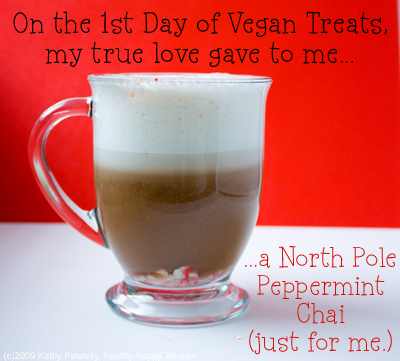 On the first day of vegan treats, my true love gave to me, a North Pole Peppermint Chai just for me. 12 Days of Vegan Treats here!! 2010 Holiday Recipe Inspirations here!! Extra Easy. Extra Tea. Two things to note about this recipe: 1) it is super easy, yet the results are quite lovely. It's amazing what a few crumbles of candy cane can do for a hot beverage. 2) Yes, I added not one, but two tea bags to this recipe! I like my chai strong and bursting with tea antioxidants. So I add chai concentrate, a black tea bag and a green tea bag. Plus, that nice burst of black tea caffeine is great in the AM. 1. Pour your chai concentrate and 1/2 cup of soy milk into your serving mug. Microwave on high for 1-2 minutes, or until steamy HOT! 2. After microwaving, add the 2 tea bags to the liquid, let steep for 2-5 minutes. When bags have steeped, removes, squeeze excess liquid from bags back into mug. 3. Stir into your liquid 1 tsp of peppermint candy cane bits. Stir in your cinnamon and cayenne dashes too. 4. If you have a milk frother, froth the remaining soy milk and soy creamer into a foamy white pillow of liquid. Perfect frothing is done at about 60 degrees. If you don't have a frother you can heat this liquid to HOT and add to you beverage. 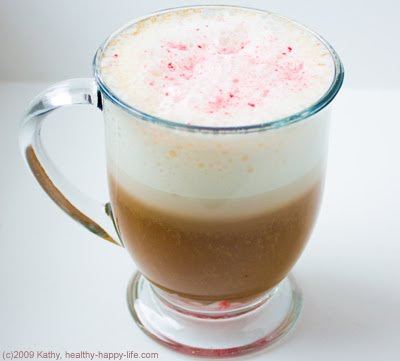 You can add in a bi more soy creamer or replace a bit of the soy milk with soy creamer - for a creamier latte. 5. On top of your beverage (hopefully you have a nice mound of foam), sprinkle about a teaspoon of candy cane bits. Add another dash of cinnamon if you'd like. Drink and enjoy this sweet minty refreshing tea latte! Optional: add a swirl of rice cream or a few vegan marshmallows for an extra-decadent treat.